Our opinion is consistent with the additional report to the Audit Committee. To the best of our knowledge and belief, the non-audit services that we have provided to the parent company and to the group companies are in accordance with the applicable law and regulations in Finland and we have not provided non-audit services that are prohibited under Article 5(1) of Regulation (EU) No 537/2014. The non-audit services that we have provided are disclosed in note 30 to the Financial Statements. We have applied an overall group materiality of € 24 million. The group audit scope included Wärtsilä Corporation parent company and all significant operating companies, as well as a large number of smaller companies, covering the vast majority of revenues, assets and liabilities. We chose profit before tax as the benchmark because, in our view, the performance of the Group is most commonly measured by using this criteria, and it is a generally accepted benchmark. 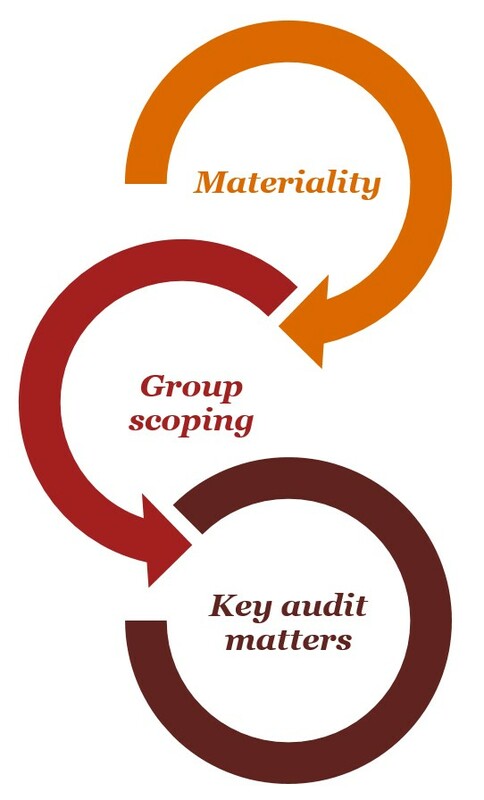 The group audit scope was tailored to take into account the structure of the Group and the size, complexity and risk of individual subsidiaries. Using this criteria we selected companies and accounts into our audit scope and at the same time ensured that we get sufficient coverage to our audit, in order to issue an audit opinion for the Group. Refer to accounting policies for the consolidated financial statements and notes 1 and 4. The group has significant revenue from construction contracts and long-term operating and maintenance agreements. These long-term contracts are often complex customised solutions and meet the definition of a construction contract (IAS 11). Revenue related to these construction contracts is recognised using the percentage of completion method, where progress is determined by comparing actual costs incurred to date, with the total estimated costs of the project. In some gas solution projects the percentage of completion is assessed with reference to surveys of work performed. For long-term operating and maintenance agreements the progress is measured by the proportion of the contracted services performed. Revenue recognition for construction contracts includes management judgment in a form of estimates, which are subject to management experience and expectations of future events. The most important judgment relates to the estimated total costs of the project. Revenue recognition of long-term contracts is a key audit matter in the audit due to the high level of management judgement involved in the project estimates. Our revenue testing included both testing of the company’s controls, as well as substantive audit procedures targeted at selected major long-term projects. Our substantive testing focused on estimates applied by management in the accounting. Recalculated the revenue based on the stage of completion of the projects. Ensured that the stage of completion is correct by comparing actual costs per the company’s accounting records to the estimated total costs of the projects. When other methods were used to determine the stage of completion, we obtained appropriate evidence based on the circumstances to conclude whether it was appropriate. Refer to accounting policies for the consolidated financial statements and note 13. Goodwill is one of the most significant balance sheet items and amounts to € 1 237 million. The determination on which cash generating unit level the goodwill is tested and whether an impairment charge is required involves significant management judgement, including estimating the future performance of the business and the discount rate applied to these future cash flows. Valuation of goodwill is a key audit matter in the audit due to the size of the goodwill balance and the high level of management judgement involved. We considered whether the sensitivity analysis performed by the management around key assumptions of the cash flow forecast was appropriate by considering the likelihood of the movements of these key assumptions. During 2017 Wärtsilä acquired Greensmith Energy Management Systems Inc. in the US for a total consideration of € 144 million. The acquisition is accounted for as a business combination (IFRS 3) and includes a number of significant and complex judgments in the determination of the fair value of the assets and liabilities acquired. The primary element of the valuation and purchase price allocation process was to assess the fair value of intangible assets (€ 42 million) in the form of technology and trademark related intellectual property. Resulting goodwill amounted to € 120 million. The allocation also considered other assets and liabilities. The purchase price allocation is reported as preliminary in the consolidated financial statements. Business combinations is a key audit matter in the audit due to the high level of management judgement used in determining the fair value for the net assets acquired. discount rate applied in the fair valuations. Refer to accounting policies for the consolidated financial statements and notes 16 and 29. Net trade receivables amount to € 1 416 million, including an impairment provision of € 62 million. The trade receivables include € 109 million long-term trade receivables. Trade receivables are recognised at their anticipated realisable value, which is the original invoiced amount less an estimated valuation allowance. Valuation of trade receivables is a key audit matter in the audit due to the size of the trade receivable balance and the high level of management judgement used in determining the impairment provision. We obtained a list of long outstanding receivables and assessed the recoverability of these through inquiry with management and by obtaining sufficient corroborative evidence to support the conclusions. We have no key audit matters to report with respect to our audit of the parent company financial statements. There are no significant risks of material misstatement referred to in Article 10(2c) of Regulation (EU) No 537/2014 with respect to the consolidated financial statements or the parent company financial statements. We were first appointed as auditors by the annual general meeting on 2 March 2017. The Board of Directors and the Managing Director are responsible for the other information. The other information comprises the report of the Board of Directors and the information included in the Annual Report, but does not include the financial statements and our auditor’s report thereon. In connection with our audit of the financial statements, our responsibility is to read the other information and, in doing so, consider whether the other information is materially inconsistent with the financial statements or our knowledge obtained in the audit, or otherwise appears to be materially misstated. With respect to the report of the Board of Directors, our responsibility also includes considering whether the report of the Board of Directors has been prepared in accordance with the applicable laws and regulations. If, based on the work we have performed, we conclude that there is a material misstatement of the other information, we are required to report that fact. We have nothing to report in this regard. We support that the financial statements should be adopted. The proposal by the Board of Directors regarding the use of the distributable funds is in compliance with the Limited Liability Companies Act. We support that the Members of the Board of Directors and the President and CEO should be discharged from liability for the financial period audited by us.